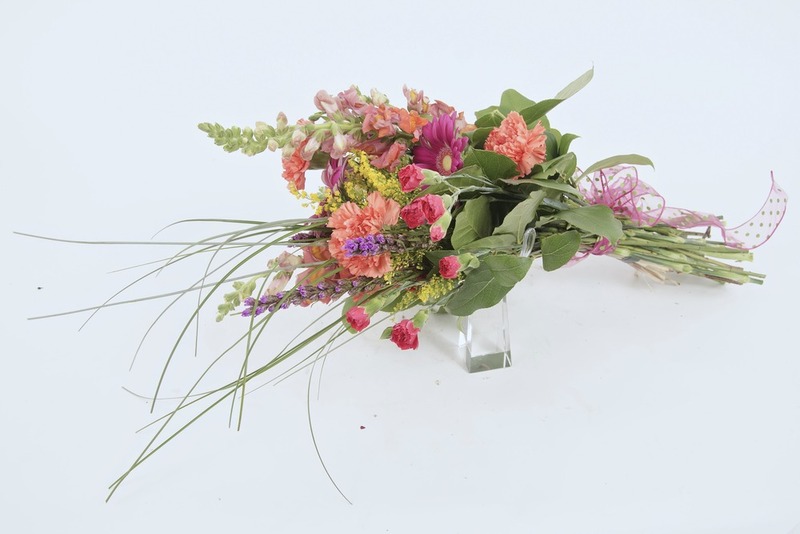 Consumer Bouquets are a favorite as there are many possibilities in design. Remove the outer covering of the bouquets. Save the decorative wrapper, the twist tie or rubber band, you may want to reuse it when sharing your garden flowers. Reuse all you can for the environments sake. Lay the flowers and foliages out in like varieties. Keep a container for the foliage that is removed for your compost or soil. Always cut the stem at an angle and place in clean fresh water with flower food. Do not use water that is connected to a water softener. Alstroemeria: remove some foliage from the base of the stem and a few from around the flower head as they block the view of the flowers. Gypsophlia/Liminoum/wax..Ie Accent/filler flowers: Clean the stem of foliages and flowers that will be under the water line. There are two consumer bouquets in each of the designs. Keeping the holding hand straight, turn the design with the right hand to the right a ¼ turn. Clean all foliage and flowers off of the stem to the top of the flower head.